Residential Grade Door Hingesare designed to meet the needs of your varied and unique lifestyle. Characterized by lighter-weight materials and a wide selection of styles, sizes, and finishes -- Residential Hinges are perfect for most everyday, around-the-house applications. The first step to choosing the right hinge is to verify the size of hinge you are replacing. To do so, measure from top to bottom on the hinge. Most door hinges are 3.5 Inches tall for interior use, and 4" tall for exterior applications, but there are other sizes as well. 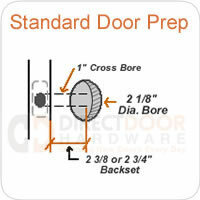 if your replacing your entry handleset or other door hardware, it's a great time to replace your door hinges as well.